The Battle of Saltley Gate - Close the Gates! deals. Up to 15,000 then marched to join miners who were picketing Saltley coke depot. The blockade forced the police, who had kept the depot open all week, to surrender and close the gates. Militant picketing involving tens of thousands of miners had shut down power stations, docks and coal depots. But the victory at Saltley, won through solidarity strikes, was the turning point for the miners. Within seven weeks the government was defeated. 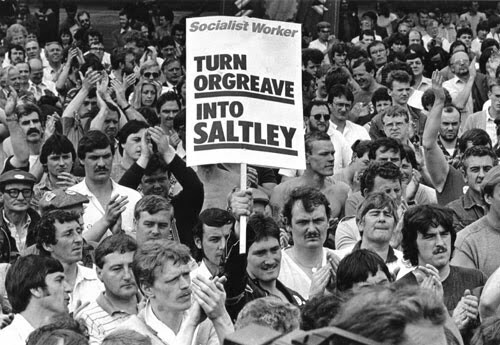 Saltley remains a key moment in British working class history. During the miners strike of 1984 - 85 the Battle of Orgreave briefly looked like it might become another Saltley and the government and police threw everything they had at it to make sure it didn't. This website celebrates the victory at Saltley Gate so that we can repeat it's victories in the future. Read an outline of how the gates were closed here. This website celebrates the victory at Saltley Gate. Click here for article links and click here to read articles on this site. We have images, song and video links to items about Saltley Gate. We will also compile links to recent news items. If you were at the Battle of Saltley Gate and would like to send us your story we will post it on the site.